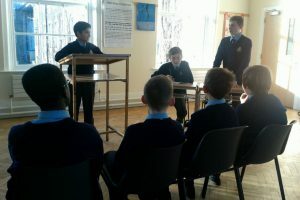 There are two debating societies within the College: the Junior Debating Society (run by Ms Coombes and Ms Lawlor) and the Senior Debating Society (run by Ms Lawlor and Mr Bordiss). These meet on a regular basis to prepare for and take part in debates. 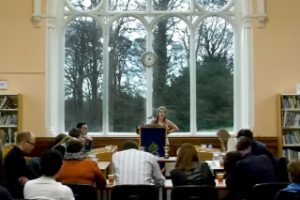 Students also enter many debating competitions such as the Aoife Begley Senior Debating Competition in NUI Maynooth or the Junior Debating Competition in UCD. During third term every year there is a Junior Gold Medal Debate and a Senior Gold Medal Debate to find the best debater in each of the societies. The Junior Debating Society meets every Tuesday at 1:15pm Room G-12. Once a month members of the Junior Debating Society watch and learn from the Senior Debating Society in the Concert Hall. The society welcomes all interested students. Even if you don’t want to debate yourself, you can still come along to watch, ask questions and offer advice and feedback. Ms Coombes, Ms Lawlor and Mr Bordiss help organise the weekly meetings. Learning about how to research a particular topic, how to structure a set of arguments, how to present arguments in front of a group, how to offer and answer points of information, etc. Discussions on current affairs and news topics. Holding of lunchtime debates on prepared topics. Students also take part in debates against other schools and enter regional and national debating competitions. Debating is a great way to express yourself, enhance your public speaking skills, gain self-confidence and improve your use of English. If you are thinking of career opportunities in areas such as education, law, politics, business or something similar then debating now may open windows of opportunity for you later on in life. If any of these reasons make sense or appeal to you, why not come along to our next meeting? All are welcome and we would be glad of any more students that joined.